Harvesting is ongoing at the farm. 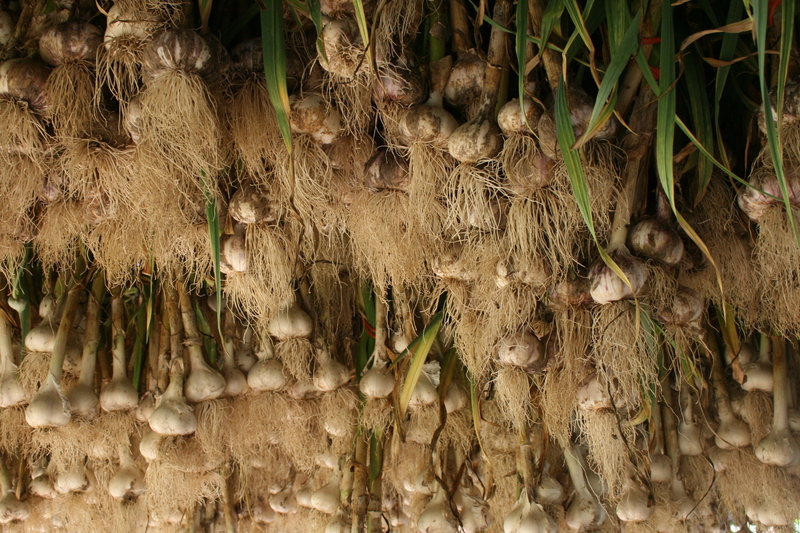 The garlic has been pulled, dried, sorted and cleaned. Potatoes are waiting to be harvested. 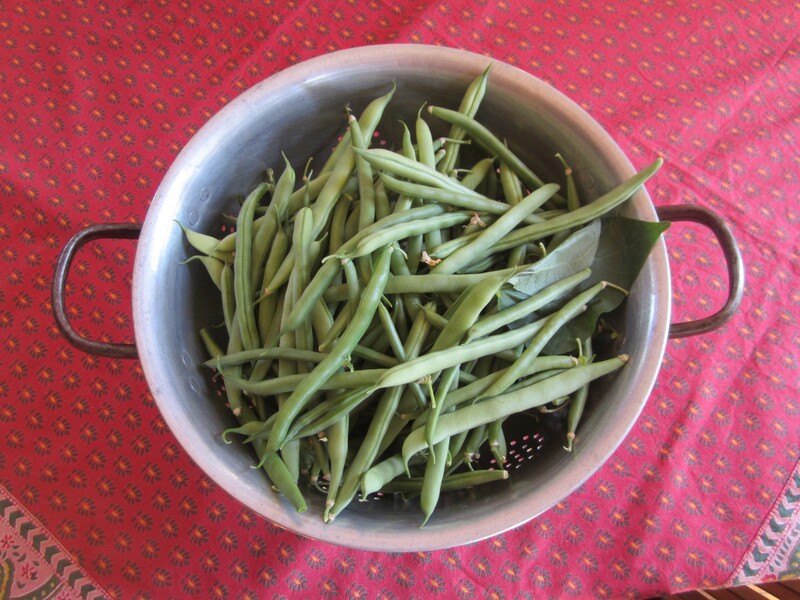 Green beans, pickling cukes and corn are all crying out for attention. Our crops are producing so well that it is hard to keep up with them. 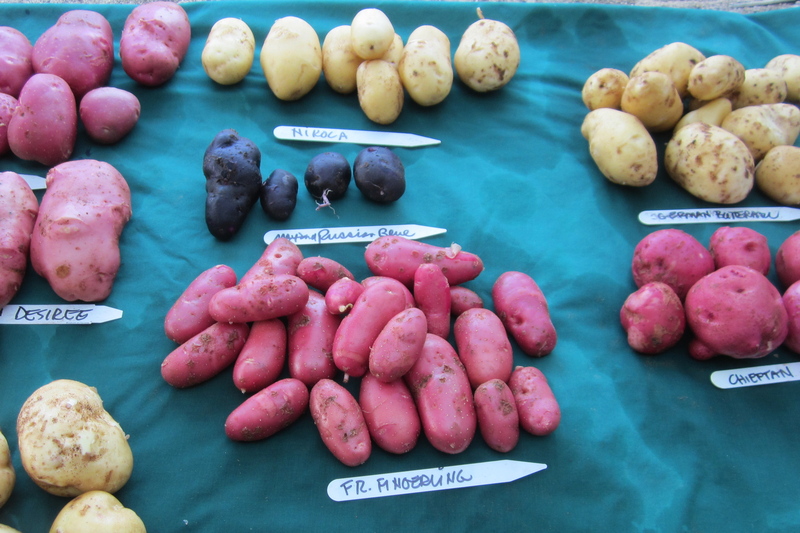 While waiting in line for harvest attention, our potatoes…German Butterball, French Fingerling, Roka, Nikola, Chieftan, Dersiree, Yukon Gold, Banana Fingerling, Russet Burbank and Russian Blue…needed to be sampled for their good looks and flavor. NEW POTATOES, GREEN BEANS & GARLIC SALAD…what a combo! I used red and white potatoes (Chieftan and German Butterball) diced in bite sized cubes and steamed until tender (with a sprinkling of salt on top of the potatoes.) While they were still a bit resistant to the prick of a fork I tossed in a good portion of very young, whole green beans and steamed about 3 minutes more. The steaming process took about 15 minutes, and while it was going on I gathered some fresh dill, peeled a half dozen large new garlic cloves and concocted a dressing. The dressing (olive oil, honey, a grainy mustard, lemon juice and cracked pepper), and the finely chopped dill and thinly sliced garlic topped off, coated and joined with the warm veggies just about perfectly. I made another attempt at perfecting the salad by using a light vegan mayonnaise as the main ingredient in the dressing and less olive oil. It was just as good as version #1. I made version #2 for guests the other night, and when we sat down at the table the first comment was “we must be at a garlic farm!” If you do not grow your own garlic, handle large amounts on a daily basis, or have a developed immunity to its potent smell and taste due to over exposure, you just might want to reduce the number of cloves by half. This warm salad was a treat. My ingredient combinations and amounts are more experiment than recipe and are prepared to taste. If you like new potatoes, green beans and garlic, give this combo a try, and adjust ingredient amounts to your taste.